The Disneyland Resort is in Anaheim, California. It is home to the original Disneyland Park, which has been a favorite among visitors to Southern California from all over the world in 1955. It was joined in 2001 by a sister park, Disney California Adventure, which is a stylized recreation and celebration of California's rich history and culture. Walt Disney himself once said, "Disneyland will never be completed. It will continue to grow as long as there is imagination left in the world." True to Walt's vision, the Disneyland of today is very different from the way it was half a century ago. To revisit the Disneyland of the past, visit Yesterland. The Disneyland Resort is divided into two separate theme parks, three hotels, and a shopping and entertainment district. The first park is the original Disney theme park Disneyland. Its sister park Disney California Adventure, which opened in 2001, is across the entry plaza on the former site of Disneyland's parking lot. Both parks are divided into "lands", or themes. At the western end of the entry plaza is Downtown Disney, the shopping and entertainment district. The three hotels are located at the west end of Downtown Disney. There is one main difference between the Disneyland Resort and Walt Disney World, and that is in Anaheim, there are many non-Disney hotels, restaurants and shops just a short distance from the park's main entrance. Disneyland's rides are generally considered classic well-themed dark rides (e.g. Pirates of the Caribbean) with the occasional thrill ride (e.g. Space Mountain), while California Adventure's rides are more thrill-oriented (e.g. California Screamin') with some family-style rides (e.g. Soarin'). The Cast Members (employees) in all sections of the park are widely known to be very friendly and helpful. The attention to detail throughout the parks is extraordinary; however, most Cast Members will not know the history behind the details. The two biggest problems with the Disneyland Resort as a whole are crowds and price. However with careful planning, both can be minimized. Disneyland is one of the most visited theme parks in the world (with 16.7 million visits in 2014, based on the TEA/AECOM figures, behind only Magic Kingdom at Walt Disney World and Tokyo Disneyland), so the parks can be pretty crowded, especially during the weekends, summer, and winter holidays, which leads to long lines for the most popular attractions. However, if you visit in the late winter or early spring, off-season lines can be short, especially during the weekdays. Disney California Adventure has fewer attractions but still has long lines, although not as long as Disneyland's attractions. John Wayne Orange County Airport (SNA IATA) in Santa Ana is one of the two closest airports to Anaheim. The Disneyland Resort Express, operated by Gray Line, provides direct bus service to the Disneyland Resort from here. Long Beach Airport (LGB IATA) in Long Beach is the same distance as John Wayne, about 14 miles from the resort, and is the smallest (i.e. easiest to deal with) in the Los Angeles area. Depending on where you are flying from it's one of the easiest ways to get to Disneyland. Although there is no direct bus service from the airport to the resort, it may be less expensive to rent a car if you're traveling with a group anyway. Interestingly, if you take the main exit from the airport, which is East Wardlow Road, eventually it becomes Ball Road, which runs directly across the north edge of Disneyland itself. Low-cost carrier JetBlue is the primary carrier at Long Beach. Los Angeles International Airport (LAX IATA) is the largest airport in the area. The Disneyland Resort Express is also available here as well. Most visitors, especially those from overseas, arriving for a visit to Disneyland or to the greater Los Angeles area tend to arrive here. LA/Ontario International Airport (ONT IATA) in Ontario in the Inland Empire is close to Disneyland; take I-10 (San Bernardino Freeway) west and exit into California State Route 57 (Orange Freeway) south, which leads directly into Anaheim. Then take either the Ball Road or Katella Avenue exit (3 and 2 respectively) and travel west. Bob Hope Airport (BUR IATA) in Burbank is the only Los Angeles-area airport that is directly served by Amtrak and Metrolink rail service. Amtrak's Pacific Surfliner directly connects the airport to Anaheim. Metrolink's Ventura County Line links the airport with Los Angeles Union Station, with many daily departures (though with limited service on weekends). Transfers to the Orange County Line or the Pacific Surfliner to Anaheim can be made at Union Station in Downtown Los Angeles. San Diego International Airport (SAN IATA) is also accessible from Disneyland, but in theory this option is viable only if you are flying Allegiant Air from El Paso or Stockton. From the airport, take a bus or taxi to the Santa Fe Depot, the southern terminus of the Pacific Surfliner. The train trip from San Diego to Anaheim lasts about two hours. As with much of California, by car is probably the easiest way to get to the Disneyland Resort from the surrounding area (or even San Diego, Las Vegas, and San Francisco). The Disneyland Resort offers ample parking both for day visitors to the park as well as hotel guests. All of the surrounding hotels offer parking, but some clearly do not have sufficient parking for the number of overnight guests. Driving to the Disneyland Resort also means braving the Southern California traffic, which at times can be overwhelming. The Disneyland website offers driving directions, as do most online map sites. Traveling from the Long Beach Airport to the Disneyland Resort can be done using surface streets instead of freeways, which can be very crowded during commute hours. Parking at the theme parks is $18 for car/motorcycle, $23 for RV/oversized vehicles, and $28 for bus/tractor trailers. Parking at Downtown Disney is free for the first two hours and $12 for each additional hour afterwards, charged in increments of $4 every 20 minutes. Valet parking is available at Downtown Disney for $6 extra from 5PM-2AM. For hotel guests, self parking $17 per night per vehicle ($22 per night per oversized vehicle), with valet parking available at $25 per night per vehicle. A pick-up/drop-off area for the theme parks is on the west side of Harbor Boulevard north of Disney Way, past the shuttle area. If you are arriving in Anaheim by train, a taxi is a reasonable option to get to the resort from the station. A one-way taxi ride from either the Anaheim or Fullerton train station is around $15 plus tip to the Anaheim Resort area. Taxis serve the hotels and a taxi stand at Downtown Disney near the Rainforest Café, on the south side of the North Self-Park Lot. One of the great advantages at the Disneyland Resort is that Disneyland Park, Disney California Adventure Park, Downtown Disney, and many "off property" hotels are all within walking distance. Unlike Walt Disney World in Florida, guests can walk between Disneyland Park, Disney California Adventure Park, and Downtown Disney in just a minute or two. There are approximately 12 "off property" hotels that are within a 10-minute walk. Some experienced visitors to the Disneyland Resort stay at the walking-distance hotels and find it more convenient to not have a car. It only takes five to 10 minutes to walk to the Disneyland entrance from a walking-distance hotel, and taking breaks in the middle of the day is much more convenient. Local trains and buses are the cheapest ways to get to the park. Anaheim's main bus and train station, referred to as ARTIC, is about two miles east of Disneyland on Katella Avenue, near Angel Stadium and the Honda Center. The station is served by Amtrak's Pacific Surfliner (San Luis Obispo to San Diego, via Santa Barbara, and Los Angeles) and Metrolink's Orange County Line (LA to Oceanside) rail service, as well as Megabus and Greyhound bus service. On weekdays from 6:30AM–8:45AM, a free Orange County Transit Authority bus (Route #430) meets Metrolink trains at ARTIC to take passengers directly into Disneyland. That same bus will take you back to ARTIC for free to meet Metrolink trains from 3:30PM-6PM. However, there is no service on weekends. Outside these times, the most convenient option is to get off the train at the Amtrak/Metrolink station in Fullerton and take OCTA Route #43 or the limited-stop #543, which run along Harbor Blvd every 15-20 min between Santa Ana and Fullerton, with a stop convenient to Disneyland. Other OCTA routes servicing the park include Route #50, which runs from Cal State University Long Beach to The Village at Orange and services ARTIC and Disneyland by running along Katella Avenue about every 30 min (though you will have to walk about 10 min down Harbor Blvd if you pick this bus); Route #46, which runs along Ball Road between Los Alamitos and The Village at Orange (this too requires a long walk from the bus stop to the park entrance); and Route #83, which goes from the Laguna Hills Mall to the Disneyland Resort by way of Santa Ana and I-5. Besides #430, OCTA routes cost $2 per boarding (cash, exact fare only). The City of Anaheim also runs a tourist bus service, Anaheim Resort Transportation (ART), with multiple routes that connect the Disneyland Resort to nearby hotels and destinations. Because it's focused on serving the resort area, this service tends to be more direct and often runs more frequently than OCTA service. Routes #14 and #15 connect ARTIC to Disneyland. One-way cash fares are $3 ($1 children/seniors/disabled), with one-day passes $5 adults, $2 children/seniors/disabled, and 3 and 5-day passes available; passes can not be purchased from the bus driver, but can be purchased online or from kiosks at ARTIC, the Disneyland Resort stop, and at certain hotels. Metro Route #460 links Disneyland with Fullerton, Buena Park (with a stop at Knott's Berry Farm), Norwalk, and Downtown LA. If you are staying at the Knott's Berry Farm Resort Hotel in nearby Buena Park, you can take advantage of their free Disneyland shuttle. Many tickets sold online through auction websites such as eBay or Craigslist are partially used multi-day park-hopper tickets. While this is a very common activity, it is prohibited by Disney: the tickets are non-transferable. There is also an inherent risk to you as a buyer, because you don't know for certain how many days remain on the ticket. If you are purchasing tickets online, only purchase from authorized brokers; resold tickets are subject to rejection at the gate. Disneyland and Disney California Adventure offer their visitors a time-saving tool called FastPass. You can get a FastPass ticket at the most popular attractions by inserting your Passport (admission ticket) into a machine. The FastPass ticket allows you to come back at a pre-determined time (printed on the ticket) and go to a shorter line, called the FastPass Return line, to enter the attraction. This works well for very crowded rides, or especially busy times of the day. Also, make sure that you note the return time before taking your FastPass ticket, since you cannot get a new FastPass until A) the printed time is reached, or B) two hours later, whichever time is shorter. Visiting Disneyland is an expensive affair. Tickets are sold at several levels: the base ticket is the Single-Day Theme Park Ticket which enables admission to only one of the two parks for a full day. By contrast, the 1-Day Park Hopper allows you to see both parks on the same day, and to move back and forth between the parks. Park Hopper tickets are also sold in increments of 2, 3, 4, and 5 days; while the ticket price increases with each day, the price per day actually decreases with each day. Multi-day Park Hopper tickets do not have to be used on consecutive days, but will expire 14 days after the first day they are used. The value of the Park Hopper ticket options should not be underestimated. All 3, 4, or 5 day tickets come with Magic Morning, which provides access into one park an hour before general opening one time during the ticket validity period. The park which this perk available at switches each day. All tickets can be purchased in person at the Disneyland Main Entrance, Disneyland.com/tickets, the Disneyland Mobile App, a travel agent, or at a local Hotel or Disney Desk. Discounts are hard to find, but California residents (bring a driver's license or utility bill to prove residency) will sometimes receive a small discount on Annual Passes. On occasion, Disneyland may offer Resident Flex tickets valid over the course of the off-season from January-May. AAA occasionally offers its members discounts, and seasonal discounts such as the "buy a day, get a seasonal pass" offer occur during non-peak seasons. If you're planning a multi-day vacation to Southern California with visits to multiple attractions including Disneyland, you can save a lot by using the Southern California CityPass. For $329 for adults (ages 10+), $286 for ages 3–9, you'll receive a 3-day Park Hopper ticket which covers admission to Disneyland and Disney California Adventure, and 1 day each at Legoland California and SeaWorld San Diego. This makes for a wonderful week long vacation and a very attractive price with about $100 off standard prices. As an added bonus to purchasing the CityPass online (instead of in person at the park ticket counters), you'll also get your choice of either the San Diego Zoo or the San Diego Safari Park (if your schedule allows you only one day in San Diego, choose to visit the San Diego Zoo instead of the Safari Park, since it's much closer to SeaWorld). And here's something even better: visiting both Disneyland and Walt Disney World in the same year is now easier with the Disney Premier Passport. For $1,439, the Passport gives an entire year of unlimited admission to all eight theme and water parks in both California and Florida, plus DisneyQuest, ESPN Wide World of Sports, and the Oak Trail Golf Course. The Passport may be purchased at the theme park ticket booths. Once in the park, everything is reachable by foot. Walking is the main way to get around the park. You can cut down on the amount of walking time by taking the Disneyland Railroad, which loops around the edge of the park and stops at Main Street, New Orleans Square, Mickey's Toontown, and Tomorrowland. There's a set of old-fashioned vehicles that run along Main Street from the entrance of the park to the hub in front of Sleeping Beauty Castle. Disneyland has pretty good access for wheelchairs and other mobility-assistance vehicles, the only exception being the Disneyland Railroad at Main Street Station. Two attractions, Finding Nemo Submarine Voyage and Sleeping Beauty Castle Walkthrough, require guests to travel up and down steps; if a guest cannot get up and down steps, there is a room with a virtual experience of the attraction. See a cast member to access these rooms. To make getting around a breeze, the Disneyland Monorail links Disneyland's Tomorrowland with Downtown Disney (theme park admission is required to board at the Downtown Disney station). However, it may sometimes be slow and inconvenient, usually at park opening. The Downtown Disney station closes 30 minutes before park closing and the Tomorrowland station closes promptly at park closing so it is recommended to arrive five minutes prior to park closing. From the Mickey and Friends parking structure you can board a tram to Downtown Disney/Main Entrance Plaza (World of Disney Store) and back. A bus shuttle service takes guests to the satellite parking lots (Puumba and Toy Story). The trams and buses run until one hour after the later park closing (usually Disneyland Park). Outside of the resort, a car is again the best way to get around, though many hotels and restaurants are just across the street. The city of Anaheim also runs an extensive shuttle service to the nearby hotels and the Anaheim GardenWalk. Disneyland Park is the original Disney theme park, which opened on July 18, 1955. While the park has changed dramatically over the years, there are still many favorite classic attractions, such as the Disneyland Railroad, Pirates of the Caribbean, "it's a small world," and Space Mountain. Today, Disneyland boasts over 50 attractions, more than any other Disney theme park. Modeled after an early 20th-century Midwestern town with many Victorian-esque structures, Main Street, U.S.A. is the first themed land you will see upon entering the park (presuming you don't enter via the Monorail); from here you can walk up the street towards the Sleeping Beauty Castle and the park hub, where you can continue into any of the other themed lands. There are few rides here; as this is the main entrance and exit, this area is composed mostly of shops, restaurants, and guest services. Disneyland Railroad — One of Disneyland's most iconic and beloved rides, this steam-powered train takes you in a clockwise loop around the edge of the park and stops at four of the themed lands — Main Street, New Orleans Square, Mickey's Toontown, and Tomorrowland. It's great for sightseeing as well as an easy way to get around the park. The trains arrive about every 5 to 10 minutes at each station. The Disney Gallery — Changing exhibitions of original Disney-themed art. Main Street Cinema — A theater modeled after a classic cinema that shows the first six Mickey Mouse cartoons. Main Street Vehicles — A set of vintage vehicles that can take you from one end of Main Street to the other, offering a leisurely ride from the Town Square at the park entrance to the park hub in front of Sleeping Beauty Castle. Hop aboard an old-fashioned Fire Engine, a Horse-Drawn Streetcar, a Jitney (an old-fashioned automobile), or an Omnibus (an open-air double-decker bus). Note that these vehicles only run during the daytime before the first parade of the day, and some (the horse-drawn streetcar in particular) only during good weather. The Disneyland Story Featuring Great Moments with Mr. Lincoln — A theater that shows an audio-animatronic Abraham Lincoln and exhibits about the Great Emancipator, as well as a documentary on Disneyland. Themed around tales of exotic tropical jungles in far-off lands, Aventureland is due west of Main Street, U.S.A. and has several popular attractions. Indiana Jones Adventure — A fast-paced dark thrill ride based on the Indiana Jones series that leads you through a cursed temple. Jungle Cruise — A popular boat ride that leads you down a jungle river past wild animals and various jungle dangers, while your friendly skipper cracks jokes. Tarzan's Treehouse — A walk-through attraction based on the tree house in Tarzan. Based on 19th-century New Orleans and sitting on the shores of the Rivers of America, this is where you'll find some of Disneyland's most popular attractions and best restaurants. Disneyland Railroad — The Disneyland Railroad makes a stop in New Orleans Square. From here, the next stop is Mickey's Toontown, followed by Tomorrowland. Haunted Mansion — A classic spooky dark ride where you explore an estate haunted by giggling ghoulies. Note that while this attraction is more silly than scary, little kids might still find it frightening. During the Halloween and Christmas season, this ride gets a makeover based on Tim Burton's The Nightmare Before Christmas, featuring Jack Skellington redecorating the mansion. Pirates of the Caribbean — One of the most imaginative and iconic Disney rides, this indoor boat ride takes you through caverns, a burning city, and an epic cannon battle in a harbor. Recent additions have added characters from the popular film series, namely Jack Sparrow and Captain Barbossa. Past New Orleans Square on the far west side of the park is this small but colorful area with many woodland critters and a couple of popular rides. Davy Crockett's Explorer Canoes — Closed for refurbishment. Paddle around the Rivers of America in a real canoe. The Many Adventures of Winnie the Pooh — An indoor ride that is based on the stories of Winnie the Pooh. Splash Mountain — A log flume water ride that leads you past various animatronic critters before concluding with a thrilling plunge down a 5-story waterfall. You will almost certainly get wet, and you'll likely get soaked. A colorful imagining of the old American West, Frontierland encompasses the Rivers of America, Big Thunder Mountain, and an engaging mixture of gentle and thrill rides. Big Thunder Mountain Railroad — A roller coaster built to look like a mine train which sends you hurtling through abandoned mine shafts, under a waterfall, past desert scenery, and dodging a rock landslide. Frontierland Shootin' Exposition — A shooting gallery arcade themed around the Old West. Mark Twain Riverboat — Closed for refurbishment. A full-sized steam paddle boat that sails around the Rivers of America, with narration by Mark Twain. Pirate's Lair on Tom Sawyer Island — Closed for refurbishment. Situated in the middle of the Rivers of America is this large play area themed around pirates and Tom Sawyer stories, with numerous hideouts and treasures. Access is only via rafts from New Orleans Square (see above). Sailing Ship Columbia — Closed for refurbishment. A full-scale replica of a three-masted sailing ship that travels around the Rivers of America. Centered around Sleeping Beauty Castle, Fantasyland has the appearance of a fanciful Bavarian village and is where you will find most of the rides based on Disney's classic animated films, which make up some of Disneyland's most iconic attractions. This area has mostly storybook-themed and gentle attractions. Alice in Wonderland — A combination indoor/outdoor dark ride that takes you through the film's storyline. This attraction is exclusive to this Disneyland. Casey Jr. Circus Train — A train ride that goes around the exterior of Storybook Land Canal Boats, past miniature scenes of famous Disney stories. Dumbo the Flying Elephant — A popular spin ride—probably the one most frequently shown in Disney commercials—where you ride Dumbo in circles around a dancing water fountain. Fantasy Faire — A recent expansion to Fantasyland where visitors can meet Disney princesses. "it's a small world" — One of Disneyland's most beloved attractions, this is an indoor boat ride that introduces visitors to singing children from all over the globe. During the holiday season, this attraction is decorated in all its festive glory. King Arthur Carrousel — An antique carousel with a medieval theme. Mad Tea Party — Another iconic attraction where you ride a spinning tea cup. Matterhorn Bobsleds — The oldest thrill ride in Disneyland, this bobsled-themed roller coaster takes you through icy caves and under waterfalls in a snow-capped peak meant to resemble the Matterhorn in Switzerland. Note that for this ride there are two different tracks, so ride both! Mr. Toad's Wild Ride — A fun and manic indoor ride that whisks you through scenes from the movie The Wind in the Willows (as well as a few memorable ones that aren't from the movie!). This attraction is exclusive to this Disneyland. Peter Pan's Flight — A dark ride based on Peter Pan, where you fly over London and Never Land. Pinocchio's Daring Journey — A dark ride based on the animated film. Pixie Hollow — A winding path that leads into a forest, decorated to make you feel like you've shrunk down to fairy-size, which ends at Tinker Bell's house, where you can meet Tinker and her friends. Sleeping Beauty Castle Walkthrough — Within the iconic castle at the center of Disneyland is this walk-through attraction that leads you up stairways and down winding passageways through the castle itself, past interactive displays based on Sleeping Beauty. For those who can't climb stairs, a video version of the attraction is available near the entrance. Snow White's Scary Adventures — A scary dark ride based on the animated film. Note that this attraction might be too frightening for young children. Snow White's Grotto — A small spot next to the Sleeping Beauty Castle that showcases a set of statues of Snow White and the Seven Dwarves that were a gift to Walt alongside a small wishing well. Storybook Land Canal Boats — An outdoor boat ride that goes through miniature scenes of famous Disney stories. At the northern end of the park past Fantasyland, Mickey's Toontown is modeled after the cartoon town of Toontown in Who Framed Roger Rabbit? and has attractions geared towards young children. Chip 'n Dale Treehouse — A walk-through attraction for kids based on the living quarters of Chip 'n Dale. Disneyland Railroad — The Disneyland Railroad makes a stop in Mickey's Toontown. From here, the next stop is Tomorrowland, followed by Main Street. Donald's Boat — A walk-through attraction based on Donald Duck's home, with plenty of interactive elements for the little ones. Gadget's Go Coaster — A roller coaster based on Chip ‘n Dale Rescue Rangers, with oversized elements made to look like they're from a mouse-sized point of view. Goofy's Playhouse — A fun-house attraction based on Goofy's home. Mickey's House and Meet Mickey — A walk-through attraction based on Mickey Mouse's house and where one can meet Mickey Mouse himself. Minnie's House — A walk-through attraction based on Minnie Mouse's house. Minnie herself appears out front quite often. Roger Rabbit's Car Toon Spin — A wild indoor ride based on the movie Who Framed Roger Rabbit? Tomorrowland, based on science fiction visions of outer space and the future, has many thrill rides and cinematic attractions. Astro Orbitor — A rocket flight where guests fly around a futuristic-looking tower. Autopia — A driving course with miniature cars that wind along a scenic motorway. While many might think this to be a children's ride, there is a height requirement, as crashing may occur. Buzz Lightyear Astro Blasters — An indoor dark ride that is a game similar to laser tag, only riders need to shoot the Z's along the way as your vehicle spins around. Disneyland Monorail — The first monorail built in America connects Tomorrowland to Downtown Disney, outside the park. Disneyland Railroad — The Disneyland Railroad makes a stop in Tomorrowland. From here, the trains pass by the Grand Canyon Diorama and the Primeval World diorama with its audio-animatronic dinosaurs before stoping at Main Street. Finding Nemo Submarine Voyage — A submarine ride featuring characters from the Pixar film Finding Nemo. For those who can't climb down into the submarine, a video version of the attraction is available near the entrance. Hyperspace Mountain — The popular indoor roller coaster has recently gotten a Star Wars makeover, where you fly through a space battle based on the movies. During the Halloween season, this ride gets a spooky makeover featuring ghostly spirits in outer space. Jedi Training: Trials of the Temple — An outdoor stage show for the kiddies where young volunteers from the audience are chosen to learn lightsaber moves before fighting Star Wars villains. Shows on regular intervals throughout the day. Star Tours: The Adventures Continue — An indoor 3D motion-simulator attraction based on Star Wars, recently revamped to take place between Episodes III and IV, this is a turbulent ride which includes flights to iconic Star Wars locations and encounters with characters from the series. There are many shows at Disneyland; these are just the highlights. Exact times for these events vary by day, so check the schedule and be prepared for massive crowds; if you want a good seat for a parade, you'll want to stake out a location well in advance. Disneyland puts on plenty of parades, all of which are a must see and will be enjoyed by all age groups. Mickey's Soundsational Parade brings music to the streets each afternoon, with colorful floats, energetic dancers, and lots of musicians, while nighttime brings the Paint The Night Parade, with its many luminescent, brightly lit floats featuring many Disney characters. All of the parades start at the Town Square at the entrance to the park and run up Main Street, U.S.A., past Sleeping Beauty Castle, and end in front of "it's a small world". Most nights, Disneyland puts on its famous fireworks show. The current iteration, Disneyland Forever, incorporates both fireworks and massive projections on Sleeping Beauty Castle, the buildings lining Main Street, U.S.A., the Matterhorn, "it's a small world," and the Rivers of America. During the holiday season, Disneyland puts up plenty of decorations and dresses up some of their rides for the occasion. Halloween time brings a pumpkin festival to Main Street, U.S.A., a spooky version of Space Mountain, and a re-themeing of the Haunted Mansion based on Tim Burton's The Nightmare Before Christmas, which—fittingly—continues into the Christmas season. Christmas time brings festive decorations to the park, a holiday overhaul of "it's a small world", and the Christmas Fantasy Parade brings the joy of the season to the streets of Disneyland. Disney California Adventure is Disneyland's sister theme park which opened in February 2001. Initially the park struggled, with poor reviews and low attendance given the lack of focus or "Disney feel". However, the park has recently undergone a major overhaul, with new lands, new rides, and refurbished areas, and the response has been very positive. The park has a heavy California theme, with lands representing fanciful imaginings of certain parts of the state, although this is also where you'll find most of the Pixar-themed attractions. Based on 1920s Los Angeles, the entrance to the park is lined with Mission and Art Deco styled buildings with red streetcars running up the street to Carthay Circle, where the path splits into the other themed areas of the park beneath a replica of the classic Carthay Circle Theatre movie palace. There aren't many attractions here; as the main entrance and exit, this area is mostly shops, restaurants, and guest services. The Red Car Trolley — Based on the Pacific Electric Railway trolleys that used to ply Los Angeles streets in the 1920s, these streetcars will take you between Buena Vista Street and Hollywood Land (see below). 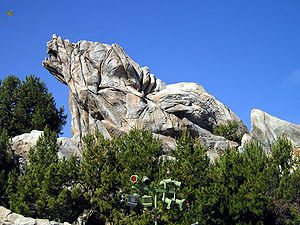 Representing the Northern California wilderness, this area is oriented around the man-made Grizzly Peak, a mountain shaped like a grizzly bear. Grizzly River Run — Roar down this white-water raft adventure around and through Grizzly Peak. Note that visitors will likely get very wet on this attraction. Redwood Creek Challenge Trail — A large play area based on the Mount Shasta wilderness, with attractions based on the films Brother Bear and Up. Soarin' Around the World — A simulator film that shows famous world landmarks as if one was hang-gliding over them. At the center of the park at a crossroads between the other themed areas, this area is modeled on Northern California's wharfs, with nods to Monterey and San Francisco. There are more restaurants than attractions here, and even some of the attractions are food-oriented. The Bakery Tour — A presentation of how sourdough bread is made; be sure to get your free sample! Walt Disney Imagineering's Blue Sky Cellar — Closed for refurbishment. A preview of Disneyland's future attractions. The largest land in the park, Paradise Pier is set around a lake at the far end of the park and is a fanciful version of an early 20th century seaside amusement park. California Screamin' — A high speed roller coaster that launches from 0–60 MPH in just 4.5 seconds! Games of the Boardwalk — An arcade modeled after old-fashioned boardwalk games, with Disney themes. Golden Zephyr — A spin ride with retro rocket ship models as the spinners. Goofy's Sky School — A "Wild Mouse" style roller coaster, which is relatively slow but has sharp turns, with Goofy themes. Jumpin' Jellyfish — A mini-drop ride with "parachutes" painted to look like jellyfish. King Triton's Carousel — A Little Mermaid-themed carousel. The Little Mermaid: Ariel's Undersea Adventure — An indoor dark ride based on the movie The Little Mermaid. Mickey's Fun Wheel — A 150-foot tall Ferris wheel with swinging and stationary gondolas. Silly Symphony Swings — A classic swing ride. Toy Story Midway Mania! — An interactive Toy Story ride; grab some 3-D glasses before boarding your ride vehicle and zipping past a set of midway-style games. To the east of Buena Vista Street, this area is a fanciful re-creation of a Hollywood street and a studio backlot. Disney Animation — A set of attractions based around the making of animation. Animation Academy — A presentation on how to draw Disney characters. The Animation Courtyard — A display on the animation process with artifacts from the Disney animation studio. Sorcerer's Workshop — A presentation where visitors can create their own animation. Turtle Talk with Crush — A show in which visitors can interact with Crush from Finding Nemo. Disney Junior: Live on Stage! — A musical performance with characters from Disney Junior preschool shows. Monsters, Inc. Mike & Sulley to the Rescue! — An indoor dark ride based on the movie Monsters, Inc.
Red Car Trolley — Based on the Pacific Electric Railway trolleys that used to ply Los Angeles streets in the 1920s, these streetcars will take you between Hollywood Land and Buena Vista Street (see above). Guardians of the Galaxy: Mission BREAKOUT — This drop ride sends you plunging several stories up and down, to the tune of several classic rock favorites, as you observe the Guardians of the Galaxy escape captivity from an out-of-control gantry lift. A faithful recreation of Radiator Springs from the Pixar movie Cars. Luigi's Rollickin' Roadsters — Board one of Luigi's cousins who do a synchronized "dance" behind his tire shop. Mater's Junkyard Jamboree — A spin ride, much like the tea cups in Disneyland, with tractors as the spinners. Radiator Spings Racers — Based on the same technology used on Epcot's Test Track, here you board a racing car and race side-by-side with another racer through desert scenery inspired by the film. Disney California Adventure is home to the Pixar Play Parade, with floats based on the Disney/Pixar movies, The Incredibles, Toy Story, Ratatouille, A Bug's Life, Finding Nemo, and Monsters, Inc. as well as water and bubble effects including small water jets that shoot water into the crowd. The parade takes place most days in the late afternoon, and travels along the parade route from Hollywood Land to Paradise Pier. The park also hosts a nightly show called World of Color in the Paradise Pier area of the park. It's a spectacular water and light show on a scale larger than a football field. If you don't mind the cost, buy some "Glow with the Show" mouse ears, which are remotely controlled and will automatically change colors along with the fountains. It is highly recommended that you get a FastPass at the Grizzly River Run area to assure access to a main viewing area. Special World of Color viewing areas are also available to those who have dinner in certain Disney California Adventure restaurants; inquire when making your dinner reservations. AMC Downtown Disney 12 — Catch a first-run movie at this cineplex, with stadium seating, digital projection, and surround sound. ESPN Zone — Watch your favorite sports event or play one of many arcade games. House of Blues — A stage that frequently hosts musical acts. Ralph Brennan's Jazz Kitchen — Experience the best of Bourbon Street jazz outside New Orleans. There are many gift shops throughout Disneyland and Disney California Adventure. They are so abundant, it is close to impossible to throw a stone and not hit a store. Some attractions even have gift shops located right at their exits. The complete list of shops in both parks may be found on the official website. Downtown Disney's anchor store is the World of Disney, the second largest of its kind, after the one at Walt Disney World. Essentially, this is a Disney Store on steroids. Downtown Disney also showcases a wide range of well-known retail chains. These are just a select few; see the official website for the complete list. Disney Vault 28. Specializes in boutique style pieces with Disney characters and from various designers. The original Mimi's Cafe, which opened in 1978, is located on Euclid Street near the 91 freeway and is still in business. The location on Harbor Blvd. across from Disneyland's eastern boundary opened within the last 10 years. If you're on a tight budget, and if you have the time, this might be very well worth your effort. If dining at the more upscale or "sit down" restaurants, there is a chance of not being able to get seating without an advance reservation. Some locations, especially the Blue Bayou Restaurant and Goofy's Kitchen, require a reservation weeks in advance. Reservations are made through Disney Dining at +1 714 781-DINE, or up to 60 days prior at Disney Dining's website. It is important to cancel or call Disney Dining if you will be late, as a $10 fee per person is charged for missed reservations. The restaurants in Disneyland Park and Disney California Adventure are good about accommodating gluten-free and other dietary restrictions. However, you have to ask; this information is not advertised. Restaurants which serve hamburgers will provide gluten-free buns on request. Blue Bayou and Carthay Circle (which are sit-down restaurants, and normally provide a bread basket) will provide gluten-free bread on request. Carnation Café. Table service, good breakfast menu, sandwiches, gourmet coffees and ice cream. Gibson Girl Ice Cream Parlor. An old-fashioned ice cream parlor. Jolly Holiday Bakery Café. A Mary Poppins-themed bakery; coffee, tea, lunch menu including sandwiches. Market House. Baked goods, breakfast sandwiches, Starbucks coffee. Plaza Inn. "Minnie & Friends Breakfast in the Park" (breakfast with Disney characters), lunch and dinner featuring home-style favorites like roasted chicken and pot roast. Refreshment Corner. Hot dogs, chili, soft drinks. Bengal Barbeque. Barbeque kabobs as well as snacks and drinks. Tiki Juice Bar. Dole Whip ice cream deserts, floats, pineapple spears and pineapple juice. Tropical Imports. Fruit stand, trail mix, veggie snacks. Blue Bayou Restaurant. The Blue Bayou is one of the most well known restaurants inside Disneyland. It offers amazing ambiance from inside the Pirates of the Caribbean ride. A great location for a romantic dinner or a sit-down lunch of their famous Monte Cristo Sandwich. Entrees $25– $35, you are paying for the ambiance not necessarily great food quality. Table service. Vegetarian friendly. Reservation highly recommended. Café Orléans. Table service, soups, salads, gourmet sandwiches including the Monte Cristo and crepes. French Market Restaurant. Table service and self-service buffet with jambalaya, roasted citrus chicken, creole salmon, roast beef, salads and decadent desserts. Live entertainment on the patio. Mint Julep Bar. Nonalcoholic mint juleps, specialty coffees, soft drinks. Royal Street Veranda. Chowder and gumbo in bread bowls, New Orleans-style. Harbour Galley. Sourdough bowl soups, salads, seafood. Hungry Bear Restaurant. Burgers, chicken and salads. The Golden Horseshoe. Chicken, fish and mozzarella strips, chili, and ice cream specialties in an old-timey saloon setting. Rancho del Zocalo Restaurante. Mexican favorites, soft drinks and desserts. River Belle Terrace. Popular breakfast spot (famed for the Mickey Mouse pancake), BBQ and Southern-style food for lunch and dinner. Stage Door Café. Corn dogs, chicken, fish, mozzarella strips, and snacks. There are stands selling fresh fruit at several locations in both parks. Edelweiss Snacks. Snack stand with turkey legs, chimichangas, corn on the cob, drinks. Troubadour Tavern. Bratwurst sausages, kids snacks, drinks. Village Haus Restaurant. Hamburgers, pizza and salads. Clarabelle's Frozen Yogurt. Salads, sandwiches, frozen yogurt, ice cream sandwiches. Pluto's Dog House. Hot dogs and soft drinks. Redd Rockett's Pizza Port. Pizza, pasta and salads. Tomorrowland Terrace. Breakfast, sandwiches, burgers, salads, desserts and drinks. Unlike Disneyland Park, where alcohol is not available to the general public, most restaurants in Disney California Adventure serve alcohol. Carthay Circle Lounge. Cocktails, wine, beer, sodas, and bar snacks, in an elegant atmosphere with big comfy chairs. Table service. Located on the first floor of the Carthay Circle Theater. Carthay Circle Restaurant. California Adventure's fanciest restaurant, comparable to the Blue Bayou in Disneyland Park. Seasonal cuisine. Table service. Reservations recommended. Located on the second floor of the Carthay Circle Theater, but the check-in desk is on the first floor, adjacent to Carthay Circle Lounge. Clarabelle's. Ice creams and sundaes. Fiddler, Fifer & Practical Cafe. Prepackaged sandwiches, baked goods, and Starbucks coffee. Smokejumpers Grill. Hamburgers, veggie burgers, and chicken. There is a very nice toppings bar which includes jalapeños, peperoncini, and roasted red peppers, in addition to the usual suspects like lettuce, tomatoes, onions, and pickles. Alfresco Tasting Terrace. Wines and appetizers, table service. Cocina Cucamonga Mexican Grill. Tacos, tamales, Mexican dishes and drinks. Ghirardelli Soda Fountain and Chocolate Shop. Ice cream, sundaes, and Ghirardelli chocolates. Everyone who enters gets a free square of chocolate. Be sure to check out the mechanical mural above the counter, which simulates events from San Francisco history, such as the fire and earthquake. Lucky Fortune Cookery. Prepackaged rice and Teriyaki bowls. Mendocino Terrace. Wine bar with an extensive selection. Pacific Wharf Café. Salads and soups in sourdough bread bowls, and a breakfast menu. Rita's Baja Blenders. Margaritas and nonalcoholic frozen drinks. Wine Country Trattoria. Italian dishes such as shrimp scampi with campanelle, fettuccine, and lasagna. Wines, casual table service. Entrees between $10–$14. Ariel's Grotto. "Ariel's Disney Princess Celebration" character dining, American-style favorites for breakfast, lunch and dinner. Table service. Bayside Brews. Beers and pretzels. Boardwalk Pizza and Pasta. Pizza, pastas, and salads. Corn Dog Castle. Corn dog stands where the dogs are made to order, with choice of wieners. Cove Bar. Above Ariel's Grotto is this patio bar with beers, wines, cocktails, and bar food. Table service. Paradise Garden Grill. Tacos and Mexican fare. Paradise Pier Ice Cream Company. Ice cream stand. Award Wieners. Hot dogs and gourmet sausages. Fairfax Market. Whole and sliced fruit, trail mix, hummus, and juices. Studio Catering Co.. Food truck serving pretzels and frozen drinks. Cozy Cone Motel. A collection of several snack vendors, each specializing in a different item such as popcorn or pretzels. Fillmore's Taste-In. Fruit stand, trail mix, and drinks. Flo's V8 Cafe. Route 66-style diner with roast beef, chicken, and BBQ dishes, as well as pies and milkshakes. Crossroads at House of Blues. Southern cuisine. ESPN Zone. A great place to escape and watch the game. Snacks $6–$11, entrees $12–$26 (for the New York Steak). Naples Ristorante e Pizzeria. Pizza, pastas, and more. Entrees $17–$25. Rainforest Cafe. Nearly a theme park in itself, Rainforest Cafe is fully decorated to theme with a jungle. Entrees $15–$40 (for the Lobster). Tortilla Jo's. Mexican food, with hand-made tortillas and live music. 33.8081-117.9271 Disneyland Hotel, 1150 Magic Way, ☎ +1 714 956 MICKEY (642539). Check-in: 3PM, check-out: 11AM. The original Disney hotel. The mid-level hotel of Disneyland's three hotels. 990 rooms and suites in three high-rise towers. Three stars. Swimming pool, hot tub, air conditioning, television, fitness center, beach, dining, game room and indoor pool. Standard rate $330-$460. 33.8078-117.9232 Disney's Grand Californian Hotel & Spa, 1600 S Disneyland Dr, ☎ +1 714 956 MICKEY (642539). Check-in: 3PM, check-out: 11AM. The higher end of Disneyland's three hotels. Convenient location with a private entrance into California Adventure's Grizzly Peak area. 745 rooms and suites. Four stars. Air conditioning, fitness center, hot tub, spa, massage, swimming pool and dining. Standard rate $380-$620. 33.8064-117.9243 Disney's Paradise Pier Hotel, 1717 South Disneyland Dr, ☎ +1 714 956 MICKEY (642539). Check-in: 3PM, check-out: 11AM. The lower end of the three Disneyland hotels. 489 rooms and suites. Three stars. Air conditioning, theater, rooftop pool and spa, fitness center, dining, hot tub, kitchen, and beach. Standard rate $260-$450. There are many designated Good Neighbor Hotels which are either within walking distance or provide transportation to and from the Disneyland Resort. Many other hotels and motels of varying cost and quality may be found in the local area. Start with Anaheim. Disneyland is within close distance of a number of other Southern California tourist attractions. Not surprisingly, some of these attractions have the word "Anaheim" in their names. 33.8025-117.921 Anaheim Convention Center (located directly south of the Disneyland Resort, across Katella Avenue). Anaheim GardenWalk, 321 West Katella Ave, ☎ +1 714 635-7400. A new outdoor shopping center, located just a stone's throw east of the Disneyland Resort. 33.833907-117.9174242 Anaheim Ice (about 1 mile north of the Disneyland Resort), ☎ +1 714 535-7465. Has two Olympic-size ice surfaces. The practice and training venue of the Anaheim Ducks, where you can also learn the sport yourself. There are also figure skating and public ice sessions. 33.8032-117.8863 The Grove of Anaheim, 2200 East Katella Ave, ☎ +1 714 712-2700. A concert venue located on the northwest corner of Angel Stadium's parking lot, adjacent to the Amtrak/Metrolink train station. Adventure City, in Stanton on Beach Boulevard south of the Ball Road intersection (about 4 miles west of the Disneyland Resort). Knott's Berry Farm, in Buena Park (take Metro Route 460. Or if you have your own car, travel west on Katella Avenue or Ball Road, then north on Beach Boulevard). Legoland California, in Carlsbad (take the Pacific Surfliner to Carlsbad or the Orange County Line south to Oceanside and transfer to Carlsbad). SeaWorld San Diego, in San Diego (take the Pacific Surfliner all the way to its southern end). Universal Studios Hollywood, in Universal City (take the Pacific Surfliner or the Orange County Line to Los Angeles Union Station, then transfer to the Metro Rail Red Line and disembark at the Universal City station). Anaheim Ducks. National Hockey League. Plays in Honda Center, just north of Angel Stadium. Los Angeles Angels of Anaheim. Major League Baseball. Plays in Angel Stadium. This city travel guide to Disneyland has guide status. It has a variety of good, quality information including hotels, restaurants, attractions and travel details. Please contribute and help us make it a star!